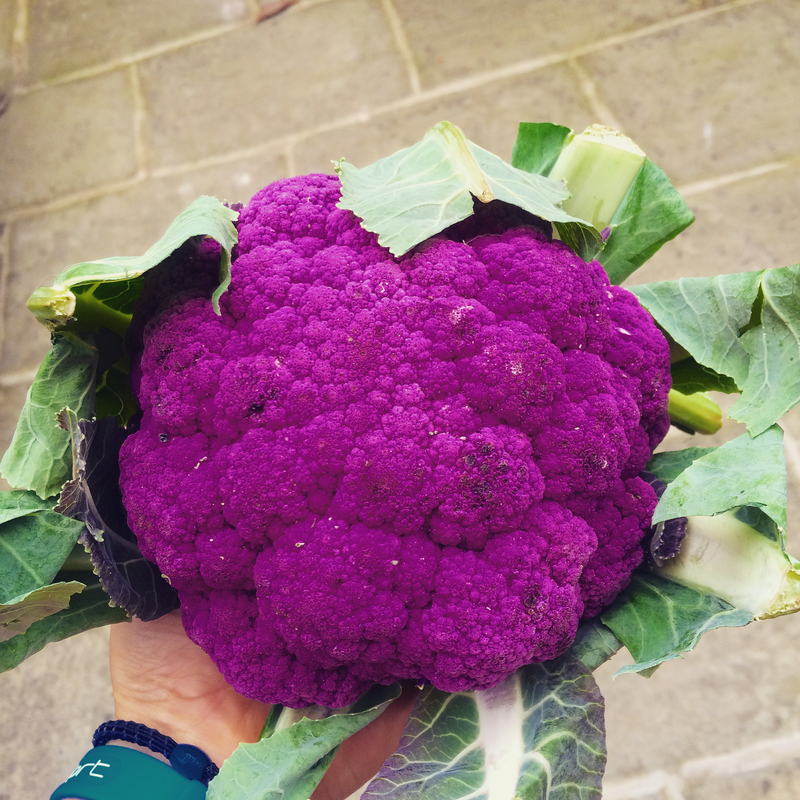 There aren’t many foods which are naturally purple, and the words ‘purple’, ‘cauliflower’ and ‘mash’ may seem as though they should never be used in the same sentence…. This definitely works though, and is the perfect thing to serve when your plate needs a little more colour and creativity (not to mention much less of the “I just ate way too much potato, I won’t be moving for a few hours” feeling)…. Mashed potato is a staple comfort food in many homes, especially as the weather begins to turn colder and we seek out warmer, satisfying, nourishing meals. The thing about white potatoes though, is that although they’re a good source of fiber, they’re also pretty high in carbohydrates, unnoticeable calories (meaning we can easily end up eating much more than the body ‘needs’ of this type of food source) and doesn’t contain as many vitamins or nutrients as its competitors sweet potato and in this case, cauliflower. While ofcourse nothing compares to a traditional potato, sometimes it’s just more interesting to make meals more… interesting. Boiled cauliflower not only contains less than half the calories of potato per serving, but it also contains almost five times the amount of vitamin C, and good levels of folate and vitamin K which aren’t present in such abundance in potatoes. The main reason for choosing a purple variety? It’s fun. The colour purple is often linked to mysticism and royalty (a Roman Emperor was known as ‘The Purple’, it was the royal colour of Caesars, and also signifies wealth and prosperity in Japan). Purple was also the first coloured dye created by man – specifically the ‘recipe’ for the dye was actually found by the man William Henry Perkin in 1856, which is probably another reason the colour links to royalty – only those who could afford the dye would be able to wear purple. If none of these facts are encouraging you to start wearing purple too – listen to THIS while you make the recipe. If purple cauliflower isn’t available, you can of course use the exact same method to prepare mashed white cauliflower. (yellow and green varieties also exist and are often found in amongst white cauliflowers in organic supermarkets and groceries). Despite cauliflower being a ‘lighter’ option than potato, it will still leave you feeling full and satiated without the heavy ‘carb-coma’ that often accompanies potato. 1 cube of vegetable stock of 2 tsp buillon powder (vegan stock) – you’ll need to save 1-2 tbsp of the liquid stock to add to the mash. 2 heaped tsp nutritional yeast (Engevita stock this with added vitamin B12, which is very much worth getting to add to meals if you’re vegan, since without supplementing, B12 is difficult to obtain from food sources. Marmite or vegemite are also good sources of B12, however if you’re particularly prone to acne, b12 can be a cause of spots and pimples. Good quality salt and pepper to taste. Pulse everything until it begins to look like ‘mash’. You may need to stop a few times and scrape down the sides to get the desired consistency, but it’s surprisingly quick to whizz up. 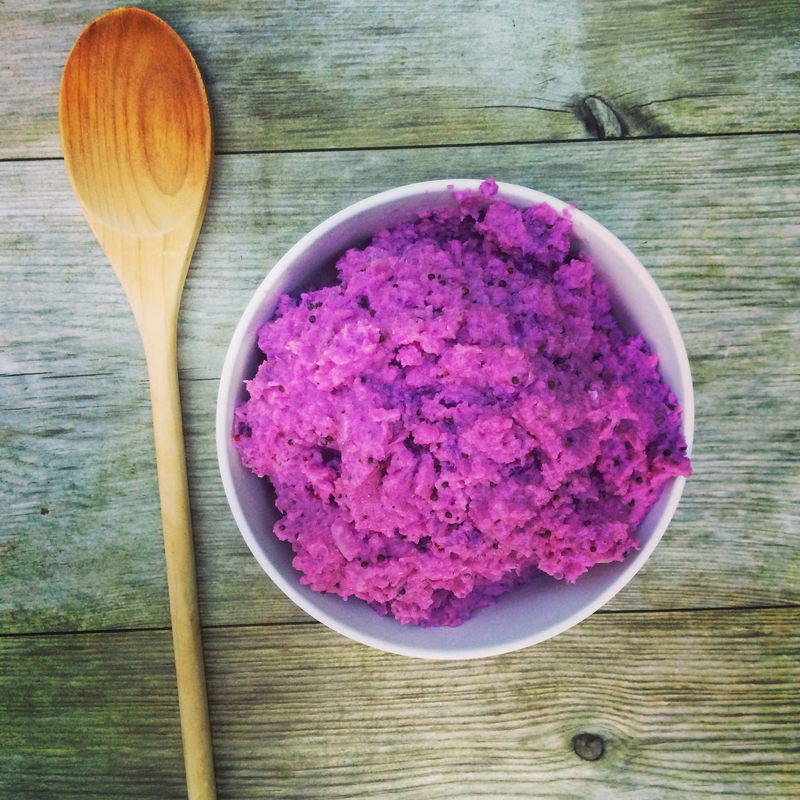 Either serve straight away or re-heat in a pan before marvelling at how amazing purple mash looks, and eating [way too much of it]….